Adam Artis’ children, part 2: Lucinda Jones. | Scuffalong: Genealogy. Adam Artis’ children, part 2: Lucinda Jones. – Scuffalong: Genealogy. Adam Artis’ children, part 2: Lucinda Jones. “Adam Artist” and “Lousinda” Jones married 10 October 1855 in Nash County. Lucinda’s father Jacob Ing (who was white) was bondsman, William T. Arrington witnessed, and justice of the peace D.A.T. Ricks performed the ceremony. Lucinda Jones Artis died circa 1860, and in 1870 her children Augustus Kerney, Noah and Mary Jane inherited her share of her father Jacob Ing’s estate. 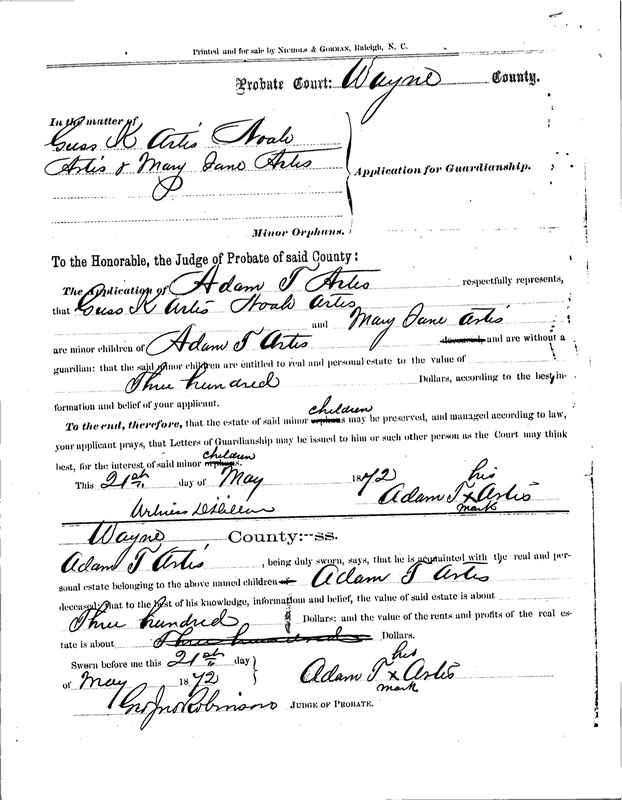 In 1872, Adam Artis filed this guardianship application in order to manage their estate. Augustus “Gus” K. Artis was born about 1857. Some time after the birth of their daughter Lena in 1882, Gus and wife Mary migrated to the Little Rock, Arkansas area. The city’s 1914 directory lists him as a laborer at J.W. Vestal & Son, a nursery. He died in 1921. Noah Artis, born in 1856, remained in northeastern Wayne County, where he farmed, married Patience Mozingo, and fathered children Nora Artis Reid, Pearl Artis, Pauline Artis Harris, Rena Belle Artis, William N. Artis, and Bessie Artis. He died in 1952 in nearby Wilson NC. Mary Jane Artis, born in 1859, married Henry Artis, son of Warren and Percey Artis. (Though all of Wayne County Artises are probably ultimately related, the exact kinship between Warren Artis, whose father was supposedly Absalom Artis, and Adam Artis is unknown.) Mary Jane remained in the Nahunta area of Wayne County all her life and died after 1900. Her and Henry’s children were Armeta Artis, Alonzo Artis, Lucinda Artis, Callonza Artis, Mattie Artis Davis and Marion Artis. → Tragedy at Charlotte Court House. ← Adam Artis’ children, part 1: the Coleys. Pingback: 100 acres on Watery Branch. | Scuffalong: Genealogy. Pingback: He would be murdered if he did not cease. | Scuffalong: Genealogy. Pingback: Artis in Arkansas. | Scuffalong: Genealogy. i am Alonzo artis of Southampton co va, wondering if there is any relation? Hi, Alonzo. Perhaps waaaaaayyyyy back. My Artises left southside Virginia before 1800, and there is no real way to reconnect the many dozens of Artis lines. Thanks for taking the time to read my blog and to post! Pingback: Timeline of Napoleon Hagans’ land transactions. | Scuffalong: Genealogy. Pingback: Misinformation Monday, no. 10. | Scuffalong: Genealogy. Pingback: Jonah’s Jonah. | Scuffalong: Genealogy.